Around the time I first read Aharon Appelfeld’s Unto the Soul (1994), I was just barely starting to write about Jews. My first published short story starred an old Yankee in Maine whose very name, Mr. Seed, invoked the sort of rootedness I’d always longed for. I’d grown up in New England, too, but my parents were outsiders. They hadn’t been raised to fish or sail or ski, and our attempts to do such things often met with disaster, a pattern I couldn’t help but associate with our being Jewish. I was from Gloucester, Massachusetts, a fishing port north of Boston. I had my own dinghy. I knew the rocks and seaweed down below our house as well as I knew my own skin. Yet it seemed I could never be of the place—not really. My Jewishness kept me apart. This sense of displacement and unease, and the desire it created in me to belong somewhere, was expressed (or rather repressed) through my early characters and stories, which rarely included Jews. I wrote about fourth-generation apple farmers, fifth-generation lobstermen; when outsiders were needed, I usually made them Italian. If anyone had asked me about this—and no one did—I probably would have pointed out to them that I was writing fiction, that in fiction one could write whatever one wanted, and that I didn’t want to write about myself. Little did I know that I was writing about nothing but myself—I was just doing it in the white space. Then I picked up Unto the Soul, which tells the story of Gad and Amalia, a brother and sister charged with guarding an ancient cemetery of Jewish martyrs on an isolated mountaintop. Here, they’re protected from the pogroms and diseases ravaging the plains below, but they’re also cut off from community and tradition. One winter, enveloped by darkness and snow, their desolation and heavy drinking spirals and they’re forced to confront the desire they feel for one another. 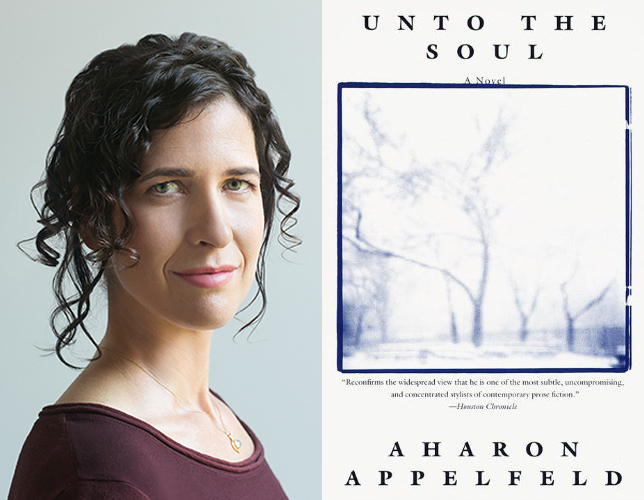 Unto the Soul, like most of Appelfeld’s work, is a dark book that resists intellectual explanation in favor of a deeply sensual, psychological probing of dislocation and despair. It’s not darkly funny, like Bernard Malamud or Philip Roth, nor is it darkly pedantic. Applefeld isn’t making a point about Judaism, or cracking jokes about Jews. In fact, the characters’ Jewishness is barely mentioned in the book—they wrestle with faith, yes; their entire purpose on the mountain is a religious one, true; yet it often feels as if theirs could be any religion. Even the first reference to their Judaism is oblique: “Sometimes [Gad] would run into a gentile woman on the way [to the tavern] and spend an hour or two with her.” We know he is Jewish only because we’re told what he is not. If Appelfeld has any point to make, it’s about darkness itself—the power of long nights, cold winds and a dank cellar to undo a person. Amalia sleeps and weeps. Gad has visions of their childhood city “down below”—he knows Amalia should descend, be married, have children, but he does not make her go. When he tries to pray, “the effort” gives him headaches. And so they are alone in the dark—without rituals or laws, and without supervision (of the human or holy variety). Appelfeld’s descriptive lens is so concentrated, so honest, that Amalia’s foot becomes real—and yet his prose, almost dreamlike in its simplicity, lends an unreality to the book. Time passes strangely: Six months can pass in a sentence; a single moment can linger and stretch for an entire chapter. Place, too, is rendered vaguely: Appelfeld tells us the name of the village where Gad and Amalia were raised, but the nameless mountaintop could be anywhere. As I read, I fell under a kind of spell—I, too, became lost on the mountaintop. And something unlocked in my own writing. I realized I’d been afraid that if I wrote about Jews I would somehow be left out, as I’d felt in my childhood. Appelfeld’s approach was more inclusive. He was exploring Jewish questions (Where do we belong? Is there a God?) without categorizing them as Jewish. He was writing such essentially Jewish characters that their Jewishness barely needed mentioning. He was showing me that in writing about Jews, I could write about everyone and belong everywhere. Anna Solomon is the author of the Boston Globe best seller The Little Bride and Leaving Lucy Pear, published this month.